Marina Abramović is one of the world's most iconic and celebrated performance artists. Her body of work stretches across more than five decades and explores the relationship between performer and audience, the limits of the body, and the possibilities of the mind. Curating the largest collections of work from the 'grandmother of performance art', ever seen in Europe, was a three year process for the Modern Museum in Stockholm. Curator Lena Essling worked closely with the artist to create a 10,000 m2 space that chronologically documented her early sketches, through early performance pieces, to her critically acclaimed 2010 piece, The Artist Is Present , in which Abramović sat silently across from 1,545 sitters including James Franco, Lou Reed and Bjork, over a period of a 736-hours and 30-minutes. 'The Cleaner' features more than 120 works and presents several of her most famous performance works as films, video installations, live performances, scenographies and photographs from the 1970s to today. It includes works created with the German artist Ulay, her partner in art and life in 1976- 1988. Several of her early pieces - paintings, photos, sound compositions and works on paper - are shown here for the first time. With much of the collection being video of her numerous performances, the museum had a challenge to create a space that felt like a gallery, utilising technology that faithfully represented the original material. A total of eight Panasonic 55" LCD displays and 33 high brightness laser projectors are cleverly integrated throughout the gallery, suspended from the ceiling and utilising the most appropriate coloured model to best blend in to the room's colour scheme. Equipped with high brightness levels of 500-cd/m2, the TH-55LF8 has a wide viewing angle and a stylish design, each is equipped with a bezel of just 6.5mm and a depth of 56.8mm to ensure seamless, large-format images. Two 7,000 and 29 x 5,200 lumen laser light source projectors (PT-RZ770 and PT-RZ570) were used to create engaging moving images. The installation is controlled using Panasonic's proprietary Multi Monitoring and Control Software. This allows the gallery to switch all of the AV technology on and off from a singe network PC terminal. Museum Curator Lena Essling, said, "We talked a lot about how we should present this work. Each work could be presented as photography, many as moving images and some as scenographies, and here we have decided to combine them. That's been a long term discussion with Marina, who is incredibly engaged about how her work is portrayed. "She has done performance art on camera since the 1970s, and is very conscious of the value of having it documented in a professional way." "So for both the artist and the museum, it's been a very important part of the work to determine how we present it and what tools we should use." Among the works on show was Balkan Baroque , for which she won the Venice Biennale in 1997. It utilises three PT-RZ570 projectors to display the work, which saw Marina make futile attempts to scrub blood and grime from a big pile of animal bones, the smell of which is also present within the museum's recreation. Victor Eklund, project manager at, Informationsteknik Scandinavia AB, said, "The quality is great compared to many other exhibitions. That's achieved by having consistent technology across the exhibition. "We had to place the projectors in a way so that they were discreet and not in the way of the other artwork. 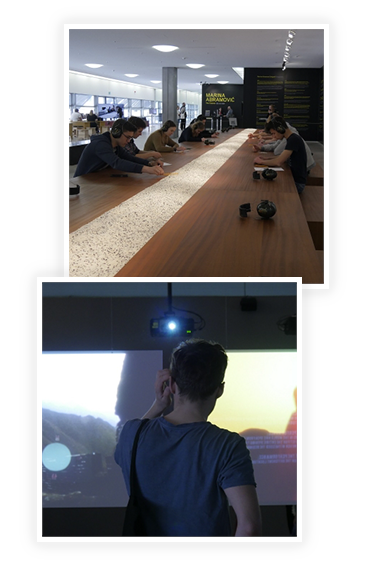 So we appreciated the ability for lens shifting and zooming within the projectors." The projectors are capable of 360-degree installation, including portrait mode for vertical image projection, on board geometric adjustment allows for specially shaped screens. Multi-Screen Support System seamlessly joins screens with edge blending and colour matching functionality. This was particularly useful for The Artist is Present , a three month exhibition at MoMa in New York. Using six PT-RZ570 projectors and a single 55 inch display, the piece is presented using rotated video of the hundreds of faces she sat across from. "It's highly interesting what kind of equipment you work with. That takes away the opaqueness of getting irritated with a bad image or an image being shown on too small a screen. The art is extremely physical and so for both the artist and us it was an important part of the process to determine what tools we would use to best display this incredibly important body of work," added Lena Essling. Marina Abramović, said: "I am a performance artist and to create a performance piece and document it, I require high quality equipment. Working with Panasonic was a truly great experience." Marina Abramović, The Cleaner, ran from 18 February 2017 to 21 May 2017.